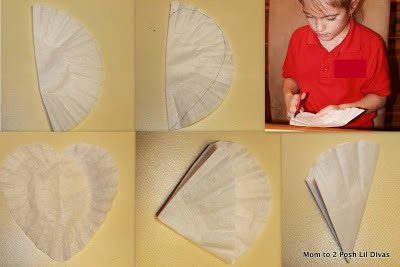 fold the coffee filter in half, draw a heart & then cut it out. 2. Fold the bottom of your 1/2 heart up along the crease. It will create the look of a triangle with the tip of the heart on top. 4. Using your bingo daubers or do-a-dot markers create a colorful pattern. Tip: Be sure to do both sides and press hard so it soaks through the filter. It's a bit messy but so worth it! The Lil Divas used lots of colors and did varied designs. never knowing what you'll see when you open it up! They look so beautiful & each one was unique! You can hang them up as decorations, display them on your windows (that's what we did & it's lovely) or you can use them to make cards (just glue onto paper) - whatever you decide to do with them, one thing is for sure - they will be a hit! No water - I just tell them to press a lot and keep the dots close together. It's a little messy but not anything that can;t be cleaned up and the result is so pretty! You have to be sure to do both sides of the paper though so that the color seeps through well. thank you! They are cheerful - love having them hung up. I teach a special education class and we don't have the daubers. Any suggestions that could create the great, vibrant color? Thanks in advance! you can create a similar effect using markers and spraying the design with a little water so that it bleeds/blends together. Another fun thing to do (which we have coming up here as we did this just the other day) is to do blot paint/symmetry art - you get lots of cool designs and if you are generous with the paint it can be very bright & oh so lovely! Not to mention it is super easy! depending on the age you teach - you can also create a tie dye effect with permanent markers & rubbing alcohol. I have not been brave enough to try this way with my girls but I have seen it all over the web & it produces lovely patterns/effects. Use food coloring to tint the water and let the kids brush the coffee filters with paint brush. The more food coloring you use, the darker and brighter the color is. You can also crush sidewalk chalk, put it in a large holed shaker, shake chalk dust on filter and spray lightly with water. Does the ink come off of hands? These turned out so great! Thanks for sharing this fun idea! Aaah they turned out so very pretty! Love them. 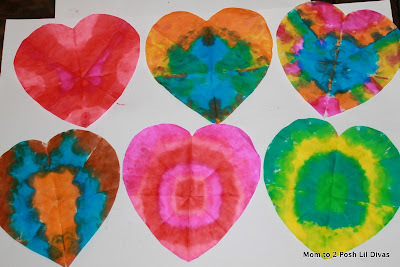 I've been planning some crafts and things for my kids to do next month in honor of Valentine's. THis looks super easy and CUTE! I am going to add this to my list. Thanks for the idea! Super nice! Love the idea of using dot paints! I will have to break mine out of storage! (My son, who has Down syndrome, graduated to paintbrushes...) Now I have a great reason to use them again, along with my coffee-drinking hubby's coffee filters! My son will love it! Love this idea!! Thanks for sharing. I might need to do it with my kids this week. I'll make sure to link back. They turned out so pretty...love the colors. Thanks for sharing. I was just thinking today that I wanted to make tie-dye heart shaped coffee filters with my son and I was trying to figure out how to do it! What a coincidence I stumbled upon your blog post (from Crafty Crow). I think I might also do this with my preschool class...seems simple enough! Thank you! These are so cute, Bern. What unique results and fun for the divas! These are beautiful. Thanks for the great idea. My 3yr olds and I made these for our valentine's day cards and they worked great. So, I just came across this on Pinterest and it looks like a great project! I'm planning the Valentine's Day party for my son's 2nd grade class and am looking for something fun for both boys and girls to make. Can you tell me though, are the coffee filters super wet when you first finish with them? Trying to decide how each child would store their finished product until the end of the day. The coffee filters are wet when you first do it but they dry quickly because they are so thin. Hope the kids enjoy the project. Wow, that really a creative Idea! This is a fun activity! I just did this with my kids and it was a hit! I'm planning a Valentine's Day party for my daughter's Pre-K class and this will be one of the activities we'll do. Thanks for the inspiration! 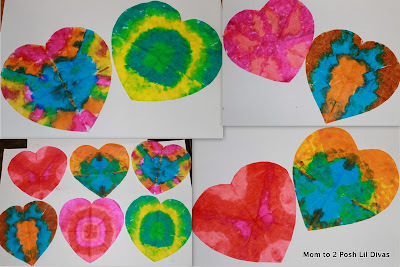 If you don't mind I would love to include this in a post on my blog for a collection of Valentine's Day projects for Pre-K kids if that's okay with you. This is an easy craft to do with little ones, and the great bonus is that you can often times find the bingo blotters at the Dollar Tree. 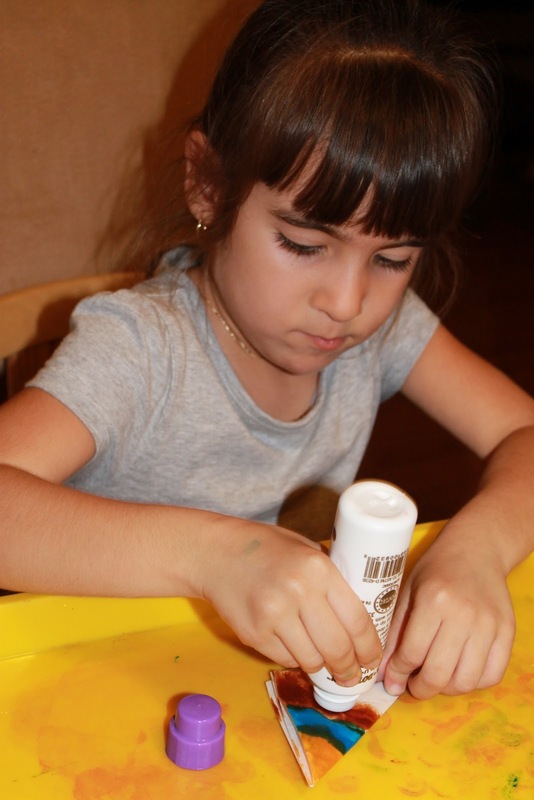 Inexpensive craft that is super kid friendly. My kind of craft.